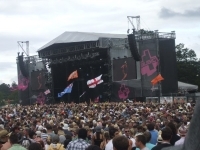 Offering many of the biggest live acts from around the world, the festival is noted for its professionalism and low queuing times, ensuring its sold-out status every year. Like the Reading and Leeds festivals, this one has a sibling festival too (with acts playing on alternate days), held in Weston Park, Staffordshire. It is a good idea to book tickets as early as possible - the line-up is guaranteed to be impressive. The V Festival is set to change its name in 2018, as Virgin is withdrawing sponsorship after 22 successful years.